The Loxahatchee River was the first of two Florida rivers designated as a Wild and Scenic River (the second being the Wekiva River), a well-deserved designation. Its name comes from an old Indian name which means, “river of turtles.” This area has historic relevance. 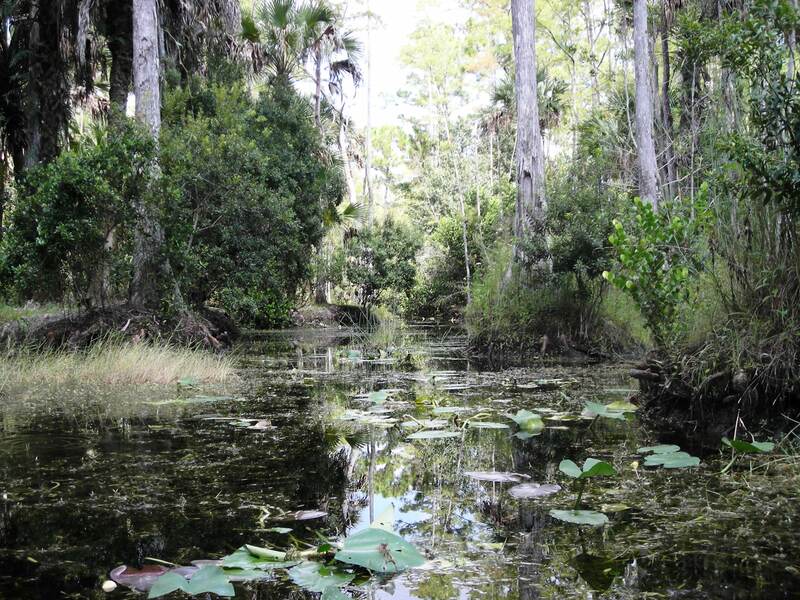 During the Second Seminole War in 1838, the Battle of Loxahatchee was fought in the area now known as Riverbend Park. I saved the Loxahatchee River for a Sunday in September because I wanted to paddle the Riverbend Park section which had been closed in August due to the low water level. From the beginning, I knew this would be a fun paddle. The man at Canoe Outfitters pulled out a map–which had been copied way too many times–and with a line forming behind me, he very quickly outlined the five mile run. It went something like this: “After you put in, go to the left and paddle about three quarters of a mile. You’ll see a small sandy beach on your left where you need to drag your kayak out and to the other side. From there, you will turn right and head toward West Lake. On the south side of West Lake you exit to Hunter’s Run which will take you under Reese’s Bridge to South Pond. Continue on Hunter’s Run to the East Grove Bridge. You’ll see a spot where you can beach and stretch your legs, and from there you will paddle to Cow Pond Lake and exit to Gator Slough run. Here, you will paddle through the cypress knees and then reach a portage where you will have to drag your kayak up and over the path again. After paddling through two culverts, you will exit to your right…” you get the picture. I felt as if I was embarking on an obstacle course! So, I headed south as directed, paddling along the slow moving, tannin river, yellowed lily pads floating atop the water. The Loxahatchee was the narrowest river I had kayaked to this point. I had to keep paddling to keep from drifting into the sawgrass along the side. One moment I was in the wilderness, preparing myself for an alligator or wild cat sighting, and then suddenly, I floated under a walkway, a reminder that civilization was nearby. I spied an occasional turtle, great blue herons, hawks, and anhingas. Cabbage palms and cypress were plentiful. I continued my paddle along the edge of a small, marshy lake, tree islands testing my skills until I came back to the narrow twisty river. With the low level of the water and the thick grasses on the bottom of the river, I found myself, at times, pushing my way through the water. And just as quickly, I was back in the open, paddling across a lake, the wind challenging me. My trip ended with a zig and a zag through the cypress knees and a paddle through the culverts. If you ever go again, give me a call and come by the house. I live in Jupiter Farms.